In hindsight there was probably nothing wrong with the first printer I purchased for this P600 printer project. If Epson USA support staff had been better informed about the auto cleaning feature of the P600, they would have probably told me to hang in there with the first one a little while longer before sending me a new one under warranty. As with the first unit, the second P600 did undergo a few of those “stealth” cleaning cycles during its first week of use in which about two dozen 8×10 equivalent-size prints were produced, but afterwards there has not been a single autoclean cycle or any need to manually perform a cleaning cycle. The second unit has performed flawlessly for over six months, and it has produced nearly 120 8×10 equivalent sized prints with 100% reliability to date. Aardenburg Imaging has had feedback from two other P600 owners who contacted us about their similar experiences of excessive initial auto cleanings in brand new units then settling into very reliable “clog-free” performance soon after 15 or 20 prints prints have been made. I believe that these early excessive autoclean cycles are required to fully purge tiny air bubbles in the ink channels when the new printer is first set up. It’s not really clogging of the nozzles in the conventional sense. Subsequent cartridge changes have so far not caused more autoclean cycles to occur. As noted above, our P600 printer has now produced nearly 120 8×10” equivalent sized prints over a six month period of time. It has been turned off and left unused for one to two weeks on four separate occasions, and just over one month in one instance. In all cases, it fired up and performed flawlessly with no additional autocleaning or manually initiated cleaning cycles. I have become so confident with the P600’s operational reliability that I seldom perform a nozzle check before use, a practice I religiously have had to follow with my older Epson 3880 printer. Relative humidity levels have been in the 55-65% range throughout most of this time, but as late fall sets in here in the Berkshires, my print studio has now dropped to 35-45% RH, and in another few months it will be chronically below 25%RH. It will be interesting to see how the P600 printer continues to perform during the winter months. Even when using a humidifier there are limits as to how much moisture one can pump into an historic building during the cold winter months before risking damage to the building’s physical structure. Here is a graph of the Amortized Costs of operating our P600 printer to date. Every cost incurred in the project, ie., the purchase price of the printer, every sheet of media consumed, every cartridge installed, their purchase price, plus every square inch of printed surface area must be tracked to build an amortization graph like the one presented. It’s not as hard as it sounds to gather this data if one uses an Excel spreadsheet to keep track of the information each time the printer is used. I will continue to update this graph with new data for many months still to come. However, we can already draw some useful conclusions. I have plotted one curve of the total amortized costs of printer, ink, and paper (an expensive fine art paper) and another curve for printer and ink only. The actual costs compiled for all prints made so far was also used to make some forward projections (the dashed-line part of the curves) to where the the costs are headed as the P600 continues to make more and more prints. Although I have actually printed on various media and kept an exact record of use in order to account for the true costs in this project, I used a constant value of $1.66 for the cost of the media used to make one 8×10 inch print for simplification and clarity in the graph. I arrived at this value by using the price I currently pay for an 8×11 sheet of Hahnemuhle Fine Art Peal 320gsm paper. There are undoubtedly fine art media both more expensive and less expensive, but this paper is fairly representative of this class of high quality fine art media. Note that you can take the cost of the printer-and-ink only curve at any point along the x axis and simply add the cost of a single 8×10 or letter-size sheet of your own choice of paper to it in order to estimate your own expected cost per print. 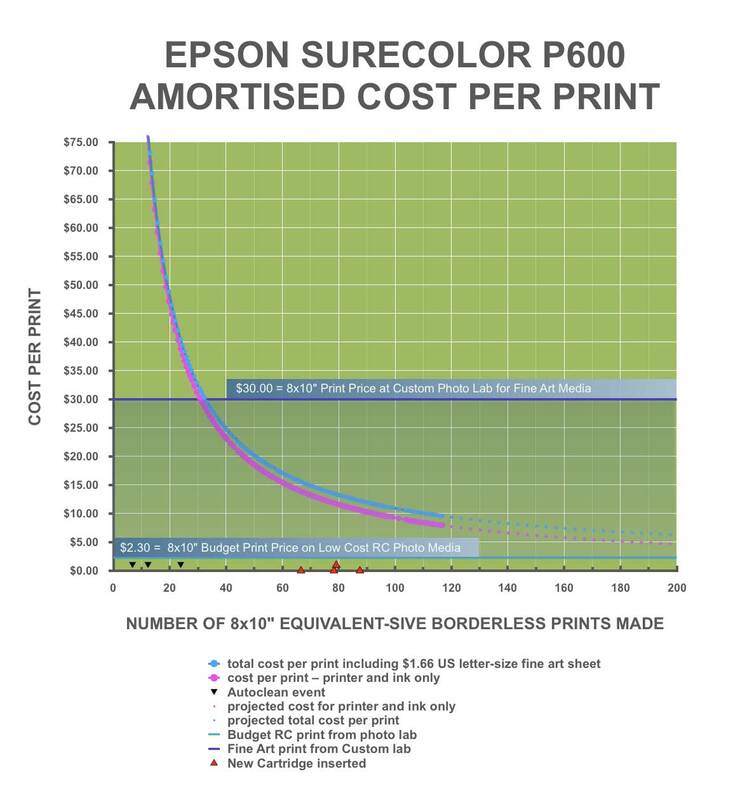 I should add that the costs shown in the graph also reflect 100% print yield from the printer, so you may ultimately want to also multiply the predicted single print prices by your own anticipated personal printmaking yields. In my case, over the past six months I actually rejected 2 prints out of the nearly 120 I have made to date on this printer. However, the rejected prints were due to my own operator error and not the fault of the printer, hence the plotted curves reflect 100% reliable print output which was indeed the case so far. In one instance I chose the wrong media setting and got a less than optimal print quality, and the other time I truly wasn’t paying attention and fed the sheet with the printable side of the paper facing the wrong direction in the paper tray. Also, I have primarily been printing family photos for a personal photo book project on this printer where I expect excellent technical quality, but I don’t sweat the details of color and tone reproduction like I do when making larger exhibition quality prints. A good color managed workflow usually delivers nearly 100% yield for quality printing in the former application, but for my “ultimate exhibition quality” print making, I typically produce one or two artist’s proofs before choosing the final image edits to be used in my ultimate “keeper” prints. I also typically only print 4-6 copies of a chosen image in a single session (and rarely ever any more copies later on) after I have perfected my final master print file. Hence, in this situation my actual print yields drop to perhaps 70-80%, whereas for most of my other printing activities, my color managed workflow and careful attention to what I’m doing usually results in 95% or more accepted prints as long as the printer I’m using is also highly reliable. I am impressed that the P600 printer has so far performed with 100% perfect mechanical reliability. Many inkjet printers I have used in the past have not performed nearly that well. The coming months will be interesting to see if the P600 keeps delivering on this outstanding reliability. Along the x-axis of the graph you will see markers for where the three auto cleaning events took place, and also where new ink cartridges were replaced with new ones (four to date). As more cartridges get replaced I expect the trend lines to lift up a bit higher, but as more prints are made, the projected costs for future prints will become more accurate. The graph also shows upper and lower boundary lines which represent real world costs of sending digital files out to professional printing services for enlargement to 8×10 image area on respective expensive and inexpensive papers. I have not done an exhaustive study of online or bricks-and-mortar printing services, but for any photographer seeking custom quality fine art printing on expensive “archival quality” media like Hahnemuhle, Canson Infinity, etc., the prices I found online were routinely $15-20 per square foot and are often higher for smaller volume “one-off” jobs at smaller print sizes. The upper boundary at $30 per 8×10 inch print reflects this choice of high quality fine art media delivered by a professional print service provider. At the other end of the spectrum are online digital printing services and big-box retail stores offering mass produced wet process photo finishing services. An economy print price for an 8×10 print on low cost RC photo paper is typically in the $3-$4 range, but the lowest price I found in a quick internet survey was $2.30 per 8×10 borderless print from an online service (mailing costs not included). It should be noted that prints delivered at the low end of the price scale typically offer significantly less print longevity and often considerably less image quality than the P600 can deliver. In the coming months when we have experienced more cartridge changes it will be interesting to see where the projected trend lines settle down in terms of total cost of ownership over longer term and higher print count experience. The current projection for printer and ink only combined with a budget priced RC inkjet paper (e.g., $0.30 to $0.40 per letter-size sheet) suggests that the P600 might eventually compete very well even with the most bargain priced photo finishing services for the enduser who does a moderate yearly volume of personal printmaking on low priced RC inkjet photo papers. Nevertheless, the amortization curve for the P600 printer clearly shows that if you have decent image editing and print making skills and can keep your personal yield for “keepers” at a reasonably high level, then printers like the P600 very quickly begin to pay for themselves when printing on expensive fine art media.